I love summer, a summer in a cottage garden. I went to visit a garden center, a striking red day lily caught my eye. I bought the pot, the only one and went home. I love the lily. The excitement in a home garden accelerates to a peak when the flowers bloom to welcome my favorite visitors, the birds!. 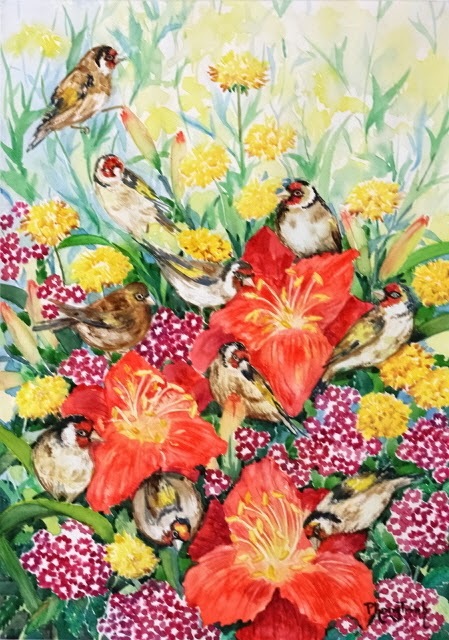 I thought about the goldfinch that come to the garden in small flock, the goldfinch that spark like summer flowers in the sun. With a brush, I gathered 'Scarlet Orbit' Day Lily, Yellow Coreposis, and Verbena for their intense colors. To help with the design I had coreposis and verbena in pots so I can move them around a bit. I wanted the painting as a summary of the summer heat and its excitement. When I stopped I realized there was a flock of ten goldfinch in the picture! The next day I learnt that day lily just last for a day! I was glad I had not missed it, an unforgettable memory!